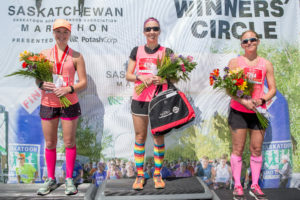 We are committed to providing opportunities for the Saskatoon running community to develop physically and mentally by providing access to training and competition for runners of all ages and abilities. We believe that this will improve personal health and well-being through fitness and social interaction. Charity of Choice Meewasin . When you register, consider a donation to help expand the Meewasin Trail in Saskatoon. The Saskatchewan Marathon is sanctioned by Sask Athletics and is a qualifier for the Boston Marathon. Stay tuned for the 2019 sanction number. Check out the finish time you need to be eligible for the Boston Marathon . Your bib is personalized with your name and the colour of the race. 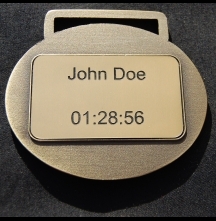 Pin your race number to your front and ensure it is visible at all times. Leave for the race early in case of traffic delays. Leave plenty of time to go to the bathroom – expect line ups. Aid Stations are spaced approximately three km apart. Each aid station has water, Gatorade and a porta potty. GU Energy Gels in a number of flavors are available for half-marathon and marathon participants at select aid stations ( approximately 11.5, 14.5, 18, 22, 24, 29 & 36 K ). 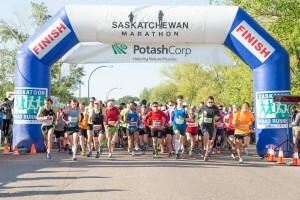 In Case of Emergency…MD Ambulance is the critical care provider for the Saskatchewan Marathon. To ensure the safety of all race participants, EMT’s are at the start/finish line. The Saskatoon Radio Club is present at aid stations and has direct communication with Marathon Event Headquarters. Watch for Craven SPORT services at the finish line and cyclists on the course for non-critical issues. Course Time Limit The course will close on a rolling basis at an approximate 8’35”/Km pace. Participants in the marathon must reach the halfway mark in three hours. Timing closes at 1:30 pm. There is no early start for any distance. All 1st, 2nd and 3rd place awards will be presented on the Winners Circle stage in the Finish Line Village. Presentation Times Yet to be Announced. Note: Runners who placed in 1st, 2nd or 3rd in the race ARE NOT eligible for Age Class Awards. Check your tim e electronically in the Finish Line Village. Once you have caught your breath after the race, approach the kiosk where our super volunteers will scan your bib number with a portable hand scanner. Software then pulls your results information and displays it on a screen: Number, Name, Category, Time, Category Place, and Gender Place. Results are posted at sportstats.ca once all results are tabulated. 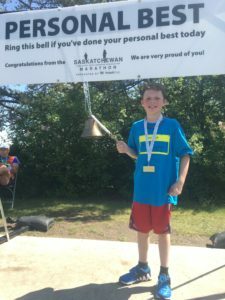 When you hear a bell ringing at the Finish Line Village, it means a participant is signaling they have run a personal best. Participants will be just beaming when ringing the bell, and family and friends can gather round to take pictures and videos of the moment in time. Participant bag drop will be open at 6:30 am- 1:30 pm. The Participant Bag Drop will be located near the Start Line in the Finish Line Village. 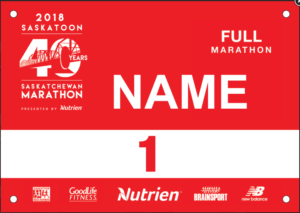 Participant’s bags will be identified with their bib number. 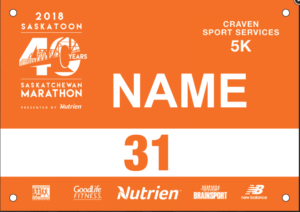 Please be sure to retrieve your bag by the official close of the Saskatchewan Marathon course. 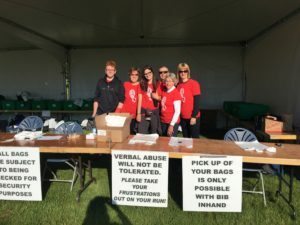 All participants using the bag drop must have all belongings inside of the bag provided by the Saskatchewan Marathon. No duffel bags, backpacks, or large purses will be accepted. NOTE: We are not responsible for lost or stolen items. 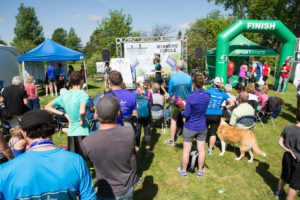 Portapotties are located at the Start/Finish line location and at all Aid Stations. Each Aid Station will have direct communication with Race Headquarters. 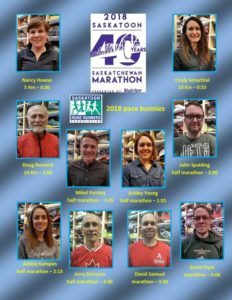 If you need help and encouragement in completing your distance in a target time, be sure to watch for one of seven pace bunnies who will be at the start and on the course. The bunnies are well identified with signs (at the start area), their distinctive hats, and identifying bibs. to you after the event. Affix the iTaB to your medal via the adhesive backing. Don’t miss out on this great keepsake! 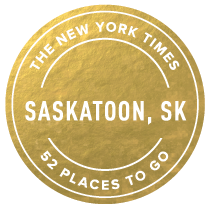 © 2014 Saskatoon Road Runners Association. All Rights Reserved.